I’ve been watching press conferences for more than 50 years, and this was the first time I was absolutely sure that the Secret Service needed to bring out a straightjacket and carry that lunatic off the stage. But the reaction of the pump truppets? 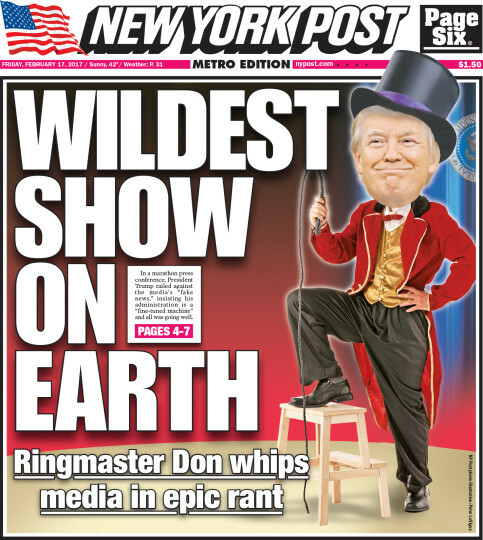 That’s the New York Post. It’s owned by illegal immigrant and virgin-blood sucker Rupert Murdoch. The truppets loved it. This entry was posted in Animals, Anime, Art, Comedy, GOP, Liars, Race relations, Stupid people by brobrubel. Bookmark the permalink.